The Vita Nuova demo grid is designed to show an Inferno Resource Grid in action. Here, the user has various resources (services, devices, data stores etc) which they wish to make available to other users. Inferno is used to export and import the resource interfaces across the network in order to provide transparent access to each resource. The registry service is used as an index of resources that users may query to find out what is available to them. The diagram below shows the resources available on the Vita Nuova demo grid. The main machine is the Inferno Registry machine, this runs the registry service with which the other services have to register. The camera device is connected to the serial port of the Inferno Registry machine. 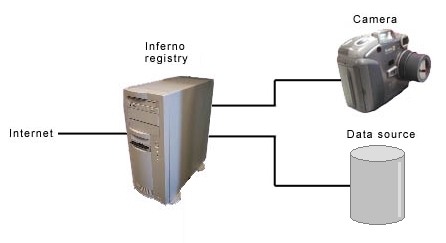 Only the Inferno Registry machine is visible to the outside world but is able to offer up the resources connected to it through the various services running on it. The services section lists all the services running on the Inferno Registry machine, click on a service to see the namespace it provides and how it is used to allow access to the resource.